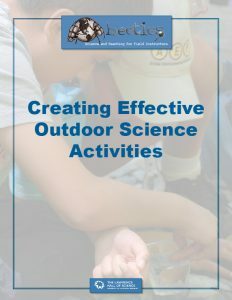 Create effective new outdoor science activities for use by multiple instructors across a program. Adapt and revise existing activities. This document lays out a BEETLES approach to designing student-centered science activities focused on exploring and figuring out the intriguing mysteries of nature. Like our other documents, it is based on many conversations with program leaders, education directors, and lead instructors like you! It also comes from many years of experience writing science activities and curriculum for classrooms, after-school programs, other informal settings, and especially the outdoors. We (Lawrence Hall of Science) also have extensive experience researching what works and what doesn’t. BEETLES applies this research, teaching experience, and successes and failures to the process of creating effective outdoor science activities.